In Illinois, when a medical condition requires immediate attention, we usually turn to our local hospital's emergency room. While emergency room doctors generally provide excellent care, the reality is that emergency rooms are often overcrowded with a minimal number of doctors, nurses and other support medical personnel. Additionally, doctors in the ER most often do not have access to a new patient's medical records and history. ER doctors must work quickly, as many patients sit in the waiting room, hoping to be called next. Patients coming into to an emergency room are scaled by their medical needs by the triage nurses. Patients with serious medical conditions will see a doctor instead of being examined upon arrival in the hospital. Sometimes an ER doctor is not informed about all of a patient's vital signs. Medical errors in judgment are made when information is lost during a change of shift, as one group of doctors, nurses and staff leaves the hospital, and a new team takes over. The result is that sometimes the staff omits something in the diagnosis or treatment leading to medical errors that can bring disaster to a patient in need of urgent care. Kreisman Law Offices has more than 40 years of experience handling emergency department malpractice cases in Chicago, Cook County, it surrounding areas and Illinois. 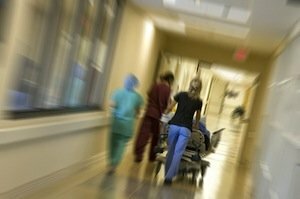 One of our recent cases dealt with the death of a client’s loved one after she was turned away from a Chicago area emergency room department. The medical staff chose not to treat her known and diagnosed brain tumor, which led to her death later that evening. We worked hard for her family and the case was settled at a pretrial conference just before the start of the trial for over $2 million. incorrectly assessing a high-priority patient in triage. The Physician Insurers Association of America (PIAA) has said that the ER is one of the areas of a hospital that generates the most medical malpractice lawsuits. Also, the PIAA has said that the average payments and legal expenses for ER cases have more than doubled over the past two decades. Another trend in hospital emergency rooms is that usage of this delivery system is on the rise, according to the Centers for Disease Control (CDC). This trend is contributing to overcrowding, long waits, and, in some cases, mistakes in diagnoses. Surveys in 2010 by the CDC showed that 20 percent of American adults ages 18-64 said they had been to an emergency room for health care at least once during the preceding 12 months. Among these patients, 79.7 percent said they turned to the ER because they had nowhere else to go. Patients who visited most often were those who did not have health insurance, the CDC has noted. Others had only public health insurance, and they said they went to an ER because their doctor's office was not open, according to the CDC. Also, patients who lived outside a metropolitan area were among those who most often visited the hospital ER. According to several medical studies, heart attacks are among the most frequently missed diagnoses, especially if the patient is under 50. Strokes are occurring more commonly among younger people, but strokes also are misdiagnosed because some doctors are not looking at stroke in their differential diagnosis when assessing a younger patient. The emergency room is no place for mistakes. Because the ER is where we go following a drastic change in our health, such as a serious fall, chest pains, or a car accident, the stakes are high. When emergency room doctors and nurses drop the ball, the results can be catastrophic, even leading to death. When there is so much at risk, you need a top quality lawyer to represent you. Kreisman Law Offices has been recognized as one of the top trial law firms in Chicago. Chicago medical malpractice attorney Robert D. Kreisman has presented to trial lawyers all over the country on the nuances of representing victims injured or killed in emergency departments. If you know of someone or have a loved one who has been injured or harmed in an emergency department setting, please call for a free and immediate consultation. Kreisman Law Offices has the knowledge and resources to obtain justice for you and your loved ones. For a free a consultation contact Kreisman Law Offices at 312.346.0045 or 800.583.8002, or fill out a contact form online.